NCW Opioid Response Conference, Pathways to Prevention, video now available! The opioid crisis has reached unprecedented levels in the United States, with more than 64,000 drug overdose deaths in 2016. A report released by the Center Disease Control in December 2017 indicates that the number of opioid-related overdose deaths have decreased the average life expectancy in the United States. Through the NCACH’s Opioid Project, community stakeholders, law enforcement officials, clinical providers, educators, policy makers, tribes, behavioral health specialists, treatment providers, and social service agencies are coming together to create a comprehensive response to the opioid epidemic that involves prevention, treatment, overdose prevention, and recovery supports. We expect to reduce the number of opioid-related deaths, overdoses, and rates of opioid abuse. NCACH’s Regional Opioid Stakeholders Workgroup meets the third Friday of the month. Meeting minutes will be shared below. Meeting locations and call-in details can be found on the NCACH Calendar. NCACH’s Rapid Cycle Opioid Project application is currently closed. March 15, 2019 @ a location near you! Join educators, students, and community leaders for a facilitated discussion to develop innovative, out-of-the-box strategies for opioid prevention in our whole community. Share your ideas. Be part of the solution! Featured speakers include Caleb Banta-Green, Professor and Health Services Interim Director for the University of Washington’s Alcohol and Drug Abuse Institute, and Dr. Charissa Fontinos, Deputy Chief Medical Officer for the Washington State Healthcare Authority. The North Central Washington Opioid Response Conference is a free conference that takes place at the same time, at multiple sites across the region. 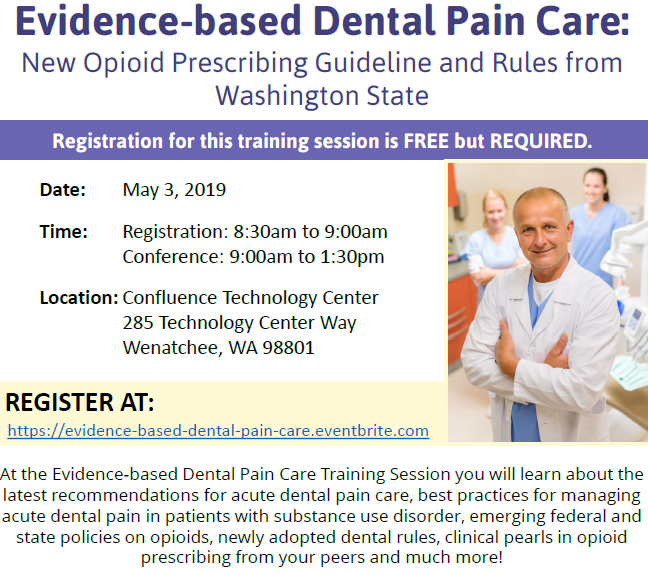 All participants will receive up to 4 hours of free dental CE, a copy of the 2017 Bree/AMDG Dental Guidelines on Prescribing Opioids for Acute Pain Management, and a one-page summary of the guidelines. This training is free and open to anyone, however, priority will be given to attendees from the North Central Accountable Community of Health region (Chelan, Douglas, Grant, and Okanogan Counties). Highlight of Opioids in Washington State This is the second time that the Washington Health Alliance has produced results looking at regional variation in opioid prescribing rates, specific to both the Medicaid and commercially insured populations. The interactive site uncovers potential hot spots of overuse and can help health care stakeholders identify and target areas in the state that may need improvement. Data can be sorted based on hospital referral area, age group, gender and/or insurance type. Note that the 2016 measurement year relies on claims data from July 1, 2015 to June 30, 2016.